The Best of Times in Genealogy? At the RootsTech Conference in early February, Curt Witcher who is the manager of the Genealogy Center at the Allen County Library in Fort Wayne Indiana proclaimed, “These are the best of times in genealogy!” His passionate keynote address touched on how the confluence of historical records that are coming online and the digital savviness of our population (especially the boomer generation) are causing unprecedented interest in genealogy and family history. Curt is one of the most respected leaders in the industry and his talk hit an emotional chord with the crowd. You can see reaction from the Twittersphere via Randy Seaver here with more on RootsTech from Ancestry Insider here and Thomas MacEntee here. Interest in genealogy and family history is expanding beyond the sole individual in a family who would break out the large folded-up papers to update the family tree each Thanksgiving. It is now attracting and taking ahold of general consumers, young and old, at lightning speed. The digital tools that are part of our everyday life are creating simplicity to the once mundane task of preserving the life stories of our ancestors and current generations. Consider the NBC show, “Who Do You Think You Are?” The network has aired three episodes this season with 6.6m viewers tuning in each week (source: Nielsen). To compare that in Internet audience terms, Google gets about 5m unique visitors per day (source: Compete.com). Yesterday, there was even more evidence as Ancestry.com announced their 2010 results. Revenues were a whopping $300.9 million for the year and their adjusted EBITDA (earnings before interest, taxes, depreciation and amortization) were $101 million. They now have 1,395,000 subscribers paying an average of $17.78 per month. These may be the best of times in genealogy but I’d argue that we’re only seeing the beginning stages of mainstream interest in genealogy and family history. With technology’s continual influence on our lives, I think there are even better times ahead of us! 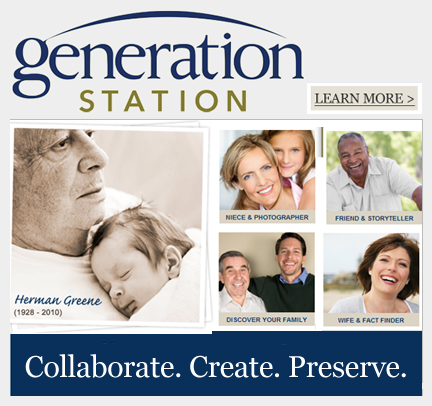 This entry was posted in Family History, Featured Main, Genealogy, GenerationStation. Bookmark the permalink.